Wednesday February 7th 1900 It looked like rain but Will and I went to town. there was a dense fog all day. I did some shopping and did not get over home till noon. Lee is still in bed he is troubled some with rheumatism again. 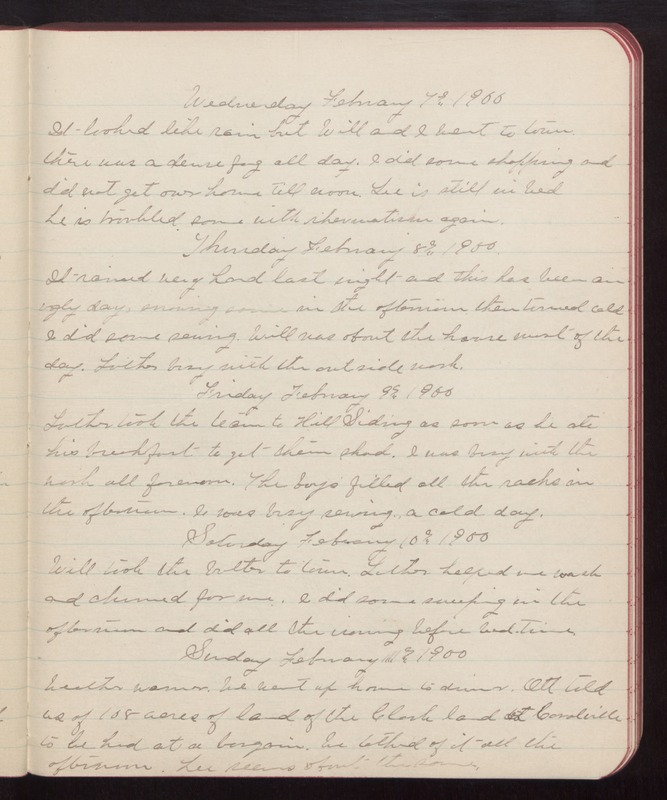 Thursday February 8th 1900 It rained very hard last night and this has been an ugly day, snowing some in the afternoon then turned cold I did some sewing. Will was about the house most of the day. Luther busy with the outside work. Friday February 9th 1900 Luther took the team to Hill Siding as soon as he ate his breakfast to get them shod. I was busy with the work all forenoon. The boys filled all the racks in the afternoon. I was busy sewing. A cold day. Saturday February 10th 1900 Will took the butter to town. Luther helped me wash and churned for me. I did some sweeping in the afternoon and did all the ironing before bed-time. Sunday February 11th 1900 Weather warmer. We went up home to dinner. Ott told us of 108 acres of land of the Clark land at Coralville to be had at a bargain. We talked of it all the afternoon. Lee seems about the same.